SEVERN Valley Railway-based Class 50 Alliance (C50A) has bought No. 50007 Hercules from Neil Boden. The purchase was made possible by means of a loan from Phil Swallow and a small number of shareholders, and has to be repaid over the next two years. Hercules is a main line operational loco currently based at Washwood Heath, but will soon join C50A’s fleet, which comprises Nos. 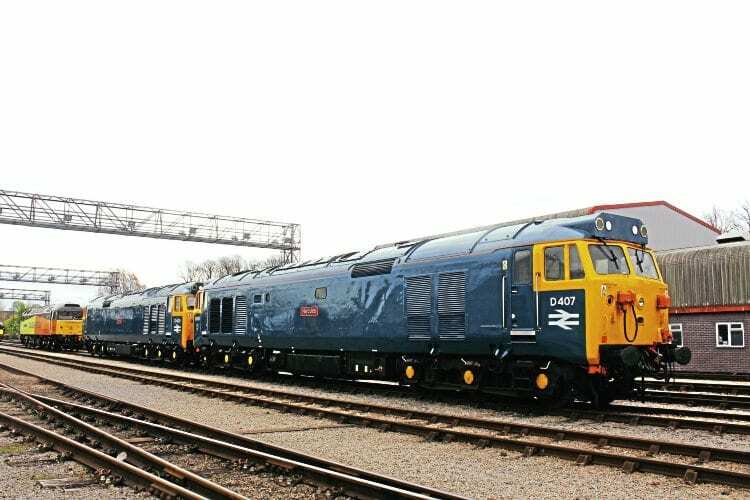 50031 Hood, 50035 Ark Royal, 50044 Exeter and 50049 Defiance. From 1984, No. 50007 received lined-green livery to commemorate the 150th anniversary of the GWR, and was named Sir Edward Elgar. It retained this guise until 2013 when returned to its original identity and BR blue livery when bought from the Class 40 Appeal at the Midland Railway-Butterley by Neil Boden, and overhauled for main line use. Hercules has been acquired because of its overall condition and suitability for main line contract work. Before entering service it will undergo a thorough technical inspection and both its main and train heat generators will be overhauled. Crew training will be with a yet-to-be named train operator. As well as main line duties it will be available for occasional use on heritage railways and on railtours. The English Electric Type 4 is expected to play a key part in the events being planned to mark the class’s 50th anniversary of entry into BR service, starting next year. This will include main line railtours, heritage railway events and merchandising opportunities, the programme to run from October through to November 2018. C50A has launched a fundraising campaign to repay the loan.